Jen Lula is a bit of celeb around these parts. She’s a well known fashion blogger and since the birth of her daughter has become a fixture in the Mama blogging scene. Currently she calls NY home but it wasn’t long ago she hailed from Massachusetts and us Bostonians are lucky to get a glimpse of her every once in a while. She has done wonderful things in the local community with the Swapaholics and it’s my belief that her blog is so popular because she is honest, sweet, and very real. With Jen what you see is what you get and we here at Monkey & The Bug just adore her for it. Be sure to read more from Jen HERE. Hi Everyone! It’s Jen from Jenloveskev. Hope you are all having a great day! I am honored to share some travel tips with you guys today. It seems like we’ve traveled a lot in these past 10 months since Rowan was born. We’ve taken her to Canada, Florida twice, Georgia, Maine, Boston (of course) and we drive around A LOT. 1. Stay Calm! The baby might cry, but if you stay calm things won’t seem so bad. I really feel like babies feed off our energy, so if you are calm it will help relax them. Don’t worry about everyone else on the plane. At worst they have to listen to a crying baby. Don’t let that be an added stress. 2. Be flexible! Being away from home, will never be the same as being at home. The faster you can adapt to new things and schedules while you are away, the easier it will be on baby. Trying to force them into new situations never works, go with the flow! 3. Bring a sling! (or other baby carrier). Being hands free in the airport is a must! You will have so much other crap to lug around, it’s nice to know the baby is strapped securely to you; especially when you are traveling alone. 4. Have Fun! Try not to let the stress of traveling and being away take away from just that, being away. Enjoy your vacation. If you forgot something I am sure there is a Target nearby to go replace it. Enjoy your little one and the adventure of sharing something new with them! With summer upon us I know a lot of you (myself included) have been doing some traveling. 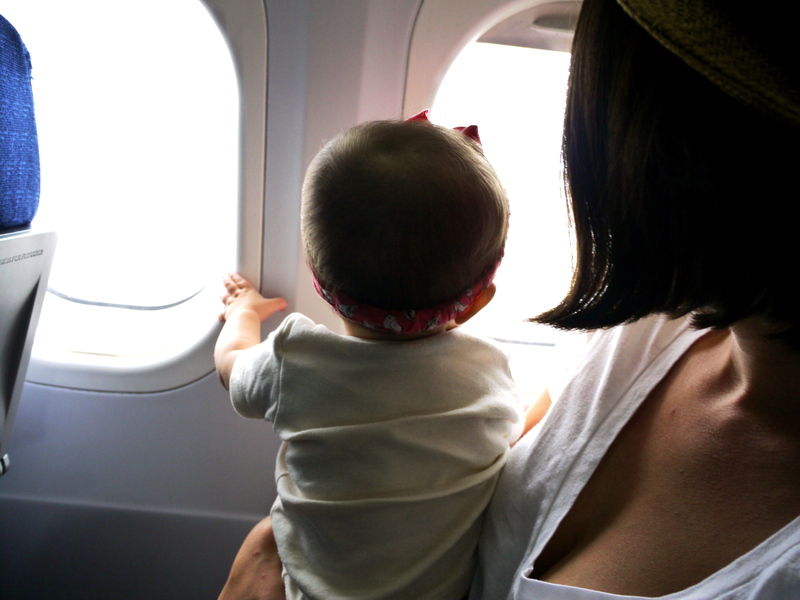 Traveling with a baby and/or toddler (or in my case toddlers) can be a nerve wracking experience. 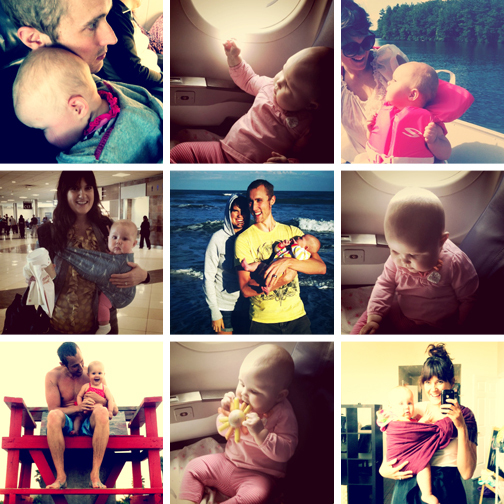 I’ve asked some of my fav mamas to share their thoughts and advice on traveling with their little ones. All of these lovely ladies make traveling with a tot look like a breeze! Our first contributor is Jillian Pye from Three for the Road. 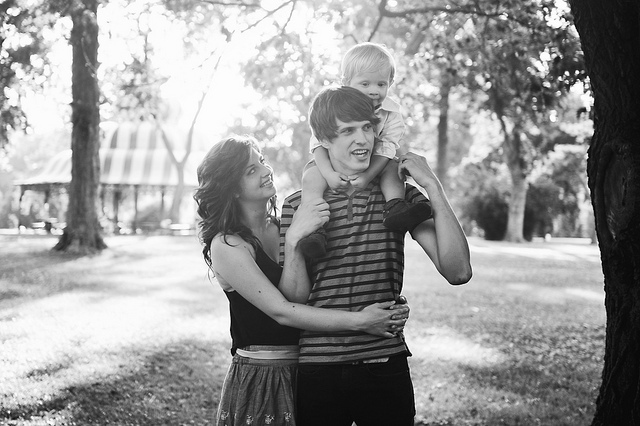 I love Jillian’s blog, it’s a great example of how NOT to lose yourself once you have a child. The Pye family have set out to live this life to the fullest and follow their dreams with babe in tow. They are breaking the mold for how to raise a family, proving that dedicating yourself to your passions can provide a wealth of life experience for your children. With out further ado….here is Jillian’s thoughts on road tripping it family style. Hi Everybody! 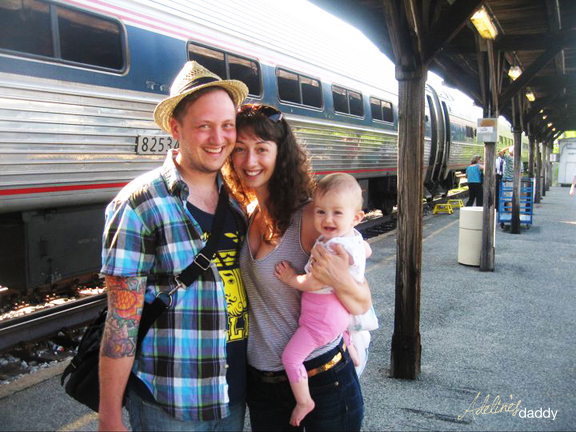 I’m Jillian and I blog over at Three for the Road—today I’m going to talk to you about traveling with a little one. 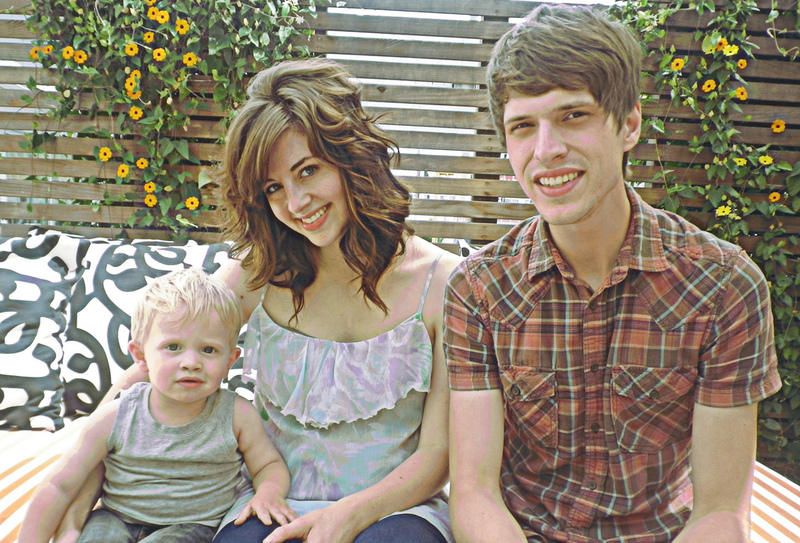 For the past few months my family has been traveling on the road full time on tour with my husband’s music. A long time ago we made the promise that no matter what happened in our lives (kids, school, job changes, etc), we would all stick together. It is really popular in the lives of musicians for significant others and children to be left behind at home–and since that isn’t really our style, we made tour a big family affair. Along the way I have learned a few tips that I would love to share with you, I am by no means an expert but maybe you will learn something new for your next family road trip! –Nothing is worse than sun in your eyes or getting sun burnt through a car window! There are some great window shades on the market for your car, we have one similar to this one and this one is great too. 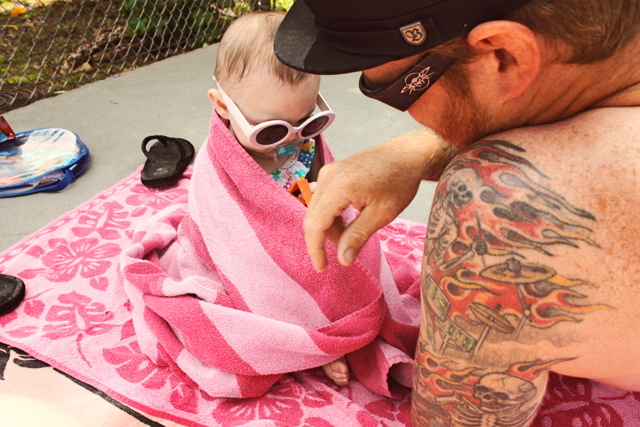 Also make sure to put sun screen on your little one, just in case–protecting their sweet little skin is so important. –Making sure your kids are eating right will also help to make sure they are pooping. Which is something you might not think of, but it is NO fun to be stuck traveling with a constipated baby! Entertainment and learning are important in your travels as well, a little nugget whose mind is stimulated will be a happy & healthy traveler! 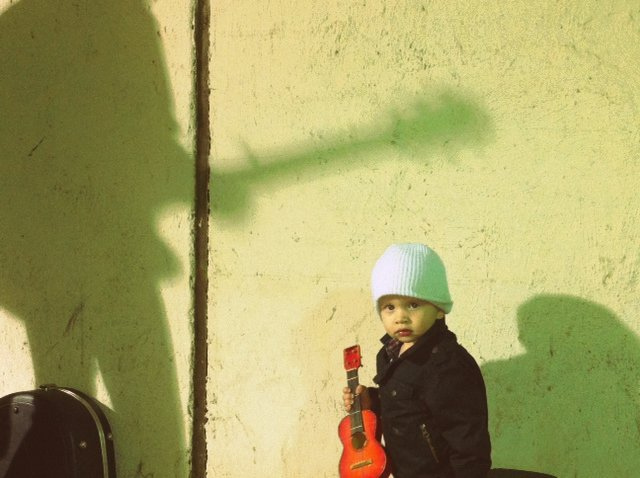 –We always brought plenty of books & cars for Cash to play with but some unconventional toys you might not have thought of that we always bring along are: a harmonica, a moracca & small ukulele–we would spend plenty of time singing songs and making music together as a family, it was always a big hit! –I would take the time to talk to Cash about what we were driving by and seeing and I would ask him questions about what he thought. Although your little one might not be much of a conversationalist yet, you will be surprised at what they learn just from hearing you talk. –Something that is not necessary but was always helpful when we had a really long drive was having a portable dvd player. We wouldn’t put it up until the day was starting to wear on and we were running out of fun activities. Flying: I have only taken Cash on a plane one time since he was born–and it was just recently when he was 22 months old. I was expecting it to be really hard, but it actually went amazingly well! We were running late for our flight because of security and were actually the last people to board the plane. 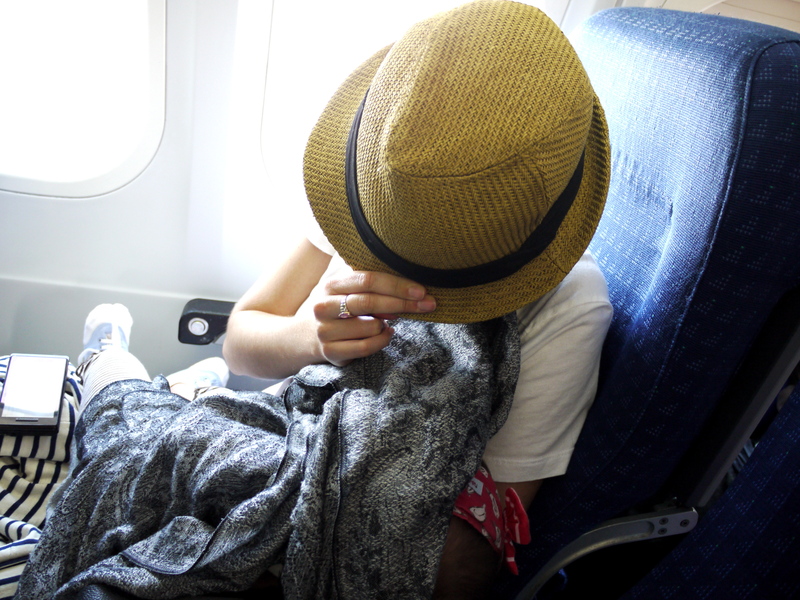 We sat in a window seat & Cash got to watch the plane take off–we talked about what was going on and about 10 minutes in I pulled his blankie out and he fell asleep right in my lap. He slept basically our whole flight and woke up 15 minutes before we landed, while he was asleep I was able to fill his cup with the apple juice that the flight attendant brought by and had some pretzels waiting for him when he awoke. He at his food and drank his juice and talked the whole time about being in an “ahhplaane.” It was an exceptionally lucky day! –Enjoy your time together as a family and don’t stress out about the trip too much. Make your plans, but know that they might not happen exactly as you planned. And don’t forget to take lots of photos! Cash is as cute as can be! Thanks so much Jillian! 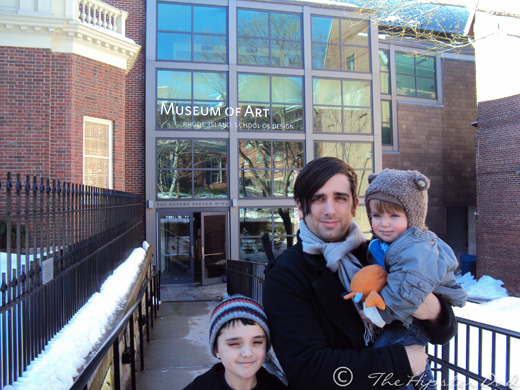 Be sure to check out the Pye family’s adventures on their blog, facebook, twitter, and etsy shop. 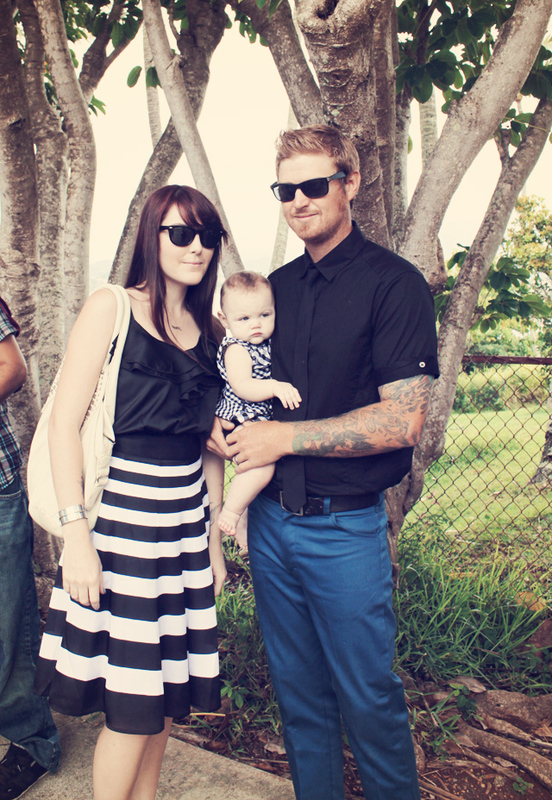 Our third guest bloggers in our Father’s Day collection are Jessica and Derek from the pretty as can be blog, Tart. 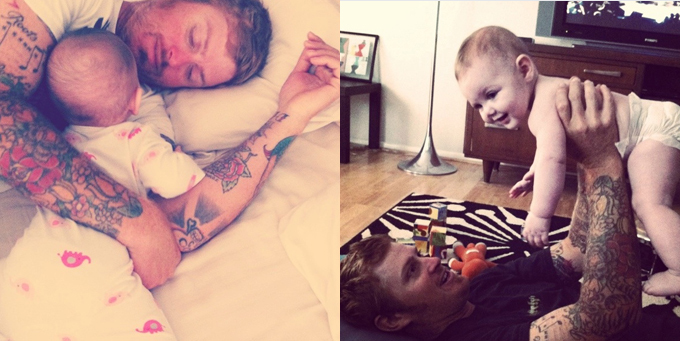 Jessica blogs about her life as a musician, stay at home Mama to Rowan, and wife to “D”. D has been known to write in a series of “Papa Posts” that are heart warming and clever. We knew they would be a perfect fit for our Father’s Day series. Be sure to check out their lovely family HERE and enjoy…. 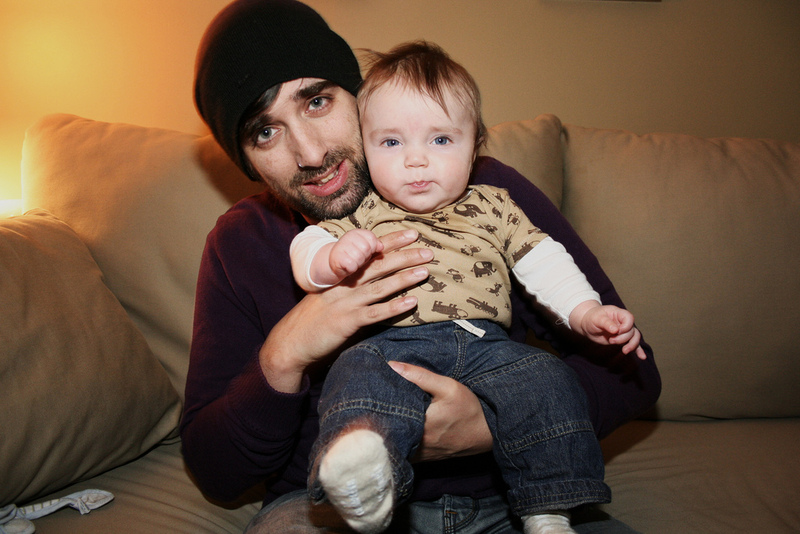 Thank you Derek for being the kindest and coolest papa ever. You play drums then change a diaper, work on your vintage cars then kiss a boo boo, put on your leopard high tops then rock a BabyBjorn. You’re everything to me and Rowan and we couldn’t be luckier. Happy Father’s Day. – make sure not to take things too seriously and have fun. you want to have some good stories for when you’re older. – your first car should be a stick-shift truck so that you learn how to drive both. – never wear the t-shirt of the band you’re going to see play. unless it’s my band of course. Our second guest posters are the Naylor Family. Both mama Rachel and Papa Don are bloggers and write beautifully about their daughter, Adeline. I’m so excited to have them both here for our Father’s Day guest series. We hope you enjoy (and good luck not tearing up on this one!). I’m feeling warm. The sun is shining where we are today. 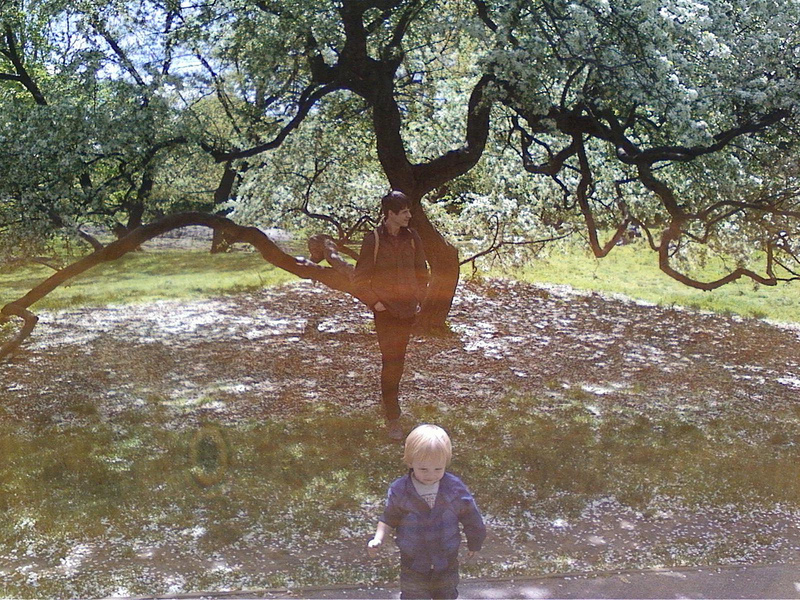 There is a breeze in the trees and we squint to see the sun drops passing through moving branches. I smile so much my cheeks ache and my eyes water. I think about the coming summer and all of the days we will have like this. A little family. My body responds with butterflies. I think of picking apples in the fall and the rustle of leaves, first snowfalls and cuddling under blankets. All of these firsts for our baby girl. I breathe out so calmly. My husband, her Daddy. He makes us feel so secure, so loved, so ready for adventure. How did I win this life? I thank my lucky stars EVERY DAY for Adeline’s Daddy. For the man he has become. For the laughter that ensues when he dances toward Addy doing his “Dada Wants Kisses” Dance. For the way our little one reaches for him when she is upset. For the way her head rests on her Daddy’s chest. For the journey that we two have made together…and the excitement that lays ahead for three. For three is surely better than two when there is such love at the core. • Your Mom & Dad are here for you – you may be a little young for this one, but in the future, please remember that your Mom & I are always here if you have any problems or need to talk. Don’t ever feel like you have nowhere to turn, share anything with us… we can help. • Don’t limit yourself – You are so young, you can accomplish anything you put enough effort and love into. • Life goes by fast – don’t waste time. • Last but not least – Always listen to your Dad. • I won’t go overboard, I’ll keep adding to the list each year… someday you will be able to read them, I Love You. .Be sure to check out Don’s Daddy adventures HERE and Rachel’s sweet Mommy blog HERE. 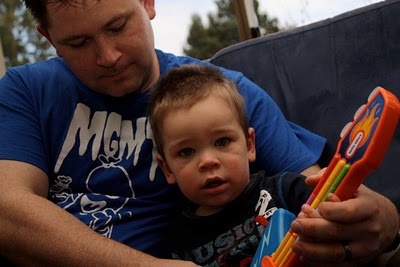 This week we will be bringing you Father’s Day posts from a few of our favorite bloggers. Some are veteran Daddy Bloggers and others a bit new to the blogging world. We asked them to share their advice for their children and the Mama’s were kind enough to tell us why they are thankful for the man in their baby’s life. We hope you enjoy! Hi there! I’m Micheline from Flyrish Foibles and I’d like to introduce you all to my amazing husband T. From early on in our courtship, I could tell that he would make an excellent father. He worked at a day camp during the summer breaks between college and the kids obviously adored him. He was goofy, sweet, and easygoing. He always offered a shoulder to cry on and a feeling of safety. Probably some of the very same reasons I fell for him. And (of course) I was right. T has been such an affectionate, loving dad to Q and they have an incredible bond. My heart jumps around in my chest when I watch these two together. When Q gets hurt and cries for his “Dad-Tob”, I swear I don’t even feel a twinge of jealousy. I just love that he seeks comfort in his daddy’s arms. And I can’t wait to see how T fares with our baby girl due this fall. He says he never imagined himself having a daughter, but I think they will have a special connection. I can so picture him doting on our daughter and creating a daddy’s girl. Happy Father’s Day to my partner in parenting and partner in life! Thank you for being such a hard-working dad. We all lub you to pieces. So, without further ado, here is T, sharing his fatherly words of wisdom. 1. Make the best of any situation, especially bad ones. Perception is 90% of any reality, so be quick to point out the positive aspects instead of getting hung up on the negatives. 2. Don’t be afraid to participate and try new things. All that you touch and see becomes you, so live it up while you are in this world. 3. Never miss the first day of class. Show up early and strive for perfect attendance. Attendance is much more important than homework. Listening to teachers is more effective than reading the books. 4. Always put out your best effort to make something you are proud to call yours. Quality is better than quantity. You will not regret putting in the time. 5. Give yourself time to rest and sleep well. You can get very far with a smile and quick wit, but you’ll need the sleep to get your head in the right place first. 6. Treat people with kindness and respect. Even if they don’t return the love, it will still come back to you. If someone does you wrong, forgive, forget and move on. 7. Don’t hesitate to share praise and show gratitude, there are only so many opportunities you will get. Remember those who helped you when you achieve great things. It is what they saw in you that allowed you to attain your dreams. With Father’s day approaching, take the time to appreciate having a Dad. Give the old man a big hug and let him know his hard work is appreciated. 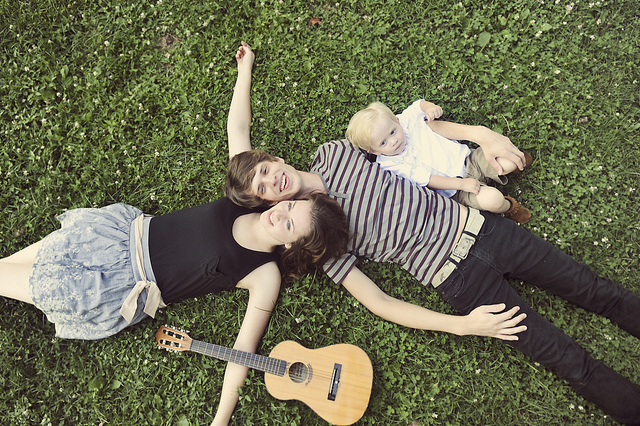 Be sure to Check out Micheline and her beautiful family of 3 (soon to be 4) HERE.